Welcome to these pages on the ancestors of the Tuckey family of Oldham. I started this record in February 2007 and am adding more information and anecdotes as time allows. I must give a great big thank you to Ann Morgan, who has spent many years researching her family tree - including the Tuckey's - and provided me with so much of the Tuckey information displayed here. Ann's information provided the long suspected link between our Tuckey's from Edinburgh and the numerous Tuckey's in the Rugby area. This photo, taken around 1871 or 1872, is of Charles Sheffield Tuckey and his family. Charles' father moved away from Rugby to take the post of butler at Ardchattan Priory, on the northern shore of Loch Etive, near Oban in Argyll, Scotland. Charles was born at Inveresragan just to the east of Ardchattan Priory. As a young man, Charles went to live with an aunt in Rugby, probably working for his uncle who owned two grocer's shops there. 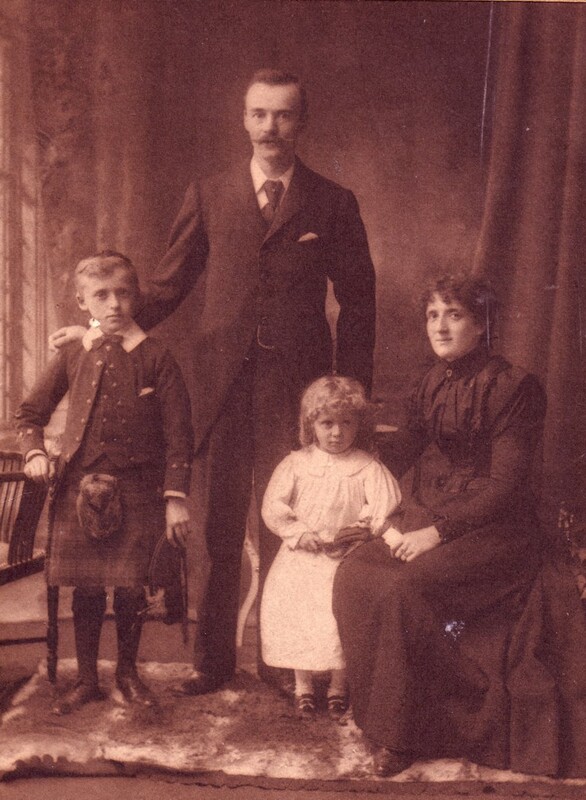 Charles' parents moved to Edinburgh and Charles himself married in Edinburgh but his bride was a girl from Rugby - Louisa Chadbourne (or Chadburn). Charles became a floor walker at a high class grocers on Princes Street, Edinburgh. The two youngsters are also named Charles and Louisa. Louisa became a photographer and did not marry. Young Charles married Gladys Culley and they had five children - Ross, Fred, Enid, Stan and Harry.